The Daily, a News Corporation publication that debuted on the iPad and was developed in cooperation with Apple, will cease to be on Dec. 15. The shuttering of The Daily after less than two years was announced by News Corporation on Monday as part of a larger corporate restructuring. Publication of the digital newspaper will halt in less than two weeks. From its launch, The Daily was a bold experiment in digital publishing and an amazing vehicle for innovation," said News Corp CEO Rupert Murdoch. "Unfortunately, our experience was that we could not find a large enough audience quickly enough to convince us the business model was sustainable in the long-term. "Therefore we will take the very best of what we have learned at The Daily and apply it to all our properties. Under the editorial leadership of Editor-in-Chief Col Allan and the business and digital leadership of Jesse, I know The New York Post will continue to grow and become stronger on the web, on mobile, and not least, the paper itself. I want to thank all of the journalists, digital and business professionals for the hard work they put into The Daily." News Corp announced that assets from The Daily will be folded into the Post, along with some employees. The publication was said to have about 120 employees after it axed a third of its staff in July. The Daily was created to help newspapers transition into the digital era dominated by tablet devices like Apple's iPad. News Corp. Murdoch's team reportedly worked with Apple and its late co-founder Steve Jobs to create an iPad-centric publication which would later be ported to Google's Android operating system. 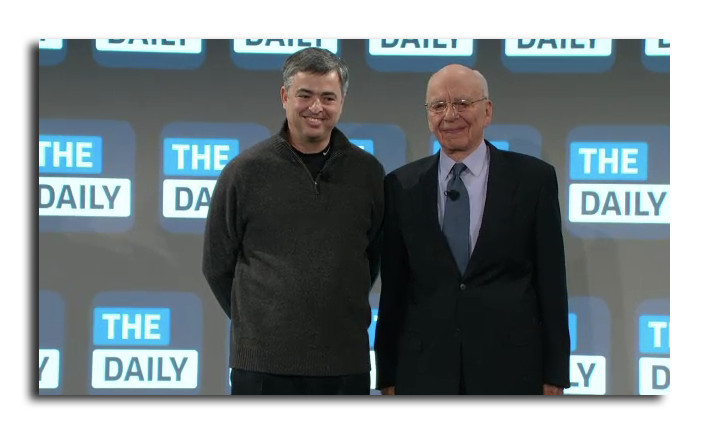 Apple's Eddy Cue and News Corp.'s Rupert Murdoch unveiled The Daily in early 2011. The iPad newspaper was announced at a press conference held by Apple and News Corp in January of 2011. At that event, Murdoch was joined onstage by Apple senior vice president Eddy Cue. The Daily was the first application on Apple's iOS App Store to feature the in-app subscription service. That functionality later became a major part of the Newsstand feature of iOS.